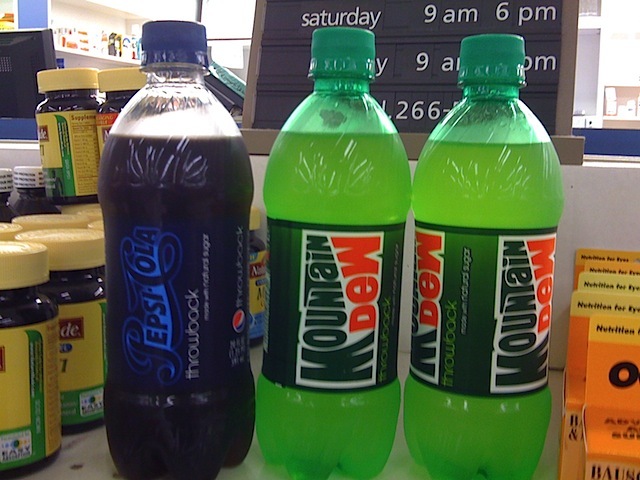 Did you find your Pepsi or Mountain Dew Throwback yet? For eight weeks starting on April 20, these drinks sweetened with sugar and not High Fructose Corn Syrup (HFCS) will be available, and yes, they are in Hawaii. Over the weekend, I managed to find both Throwback varieties in 20 oz. bottles at Safeway in Kailua. My first thoughts drinking the Throwback Dew – smooth and flat. The drink feels less carbonated but is real easy to drink. I kinda missed the extra fizz though that shouldn’t have anything to do with HFCS? 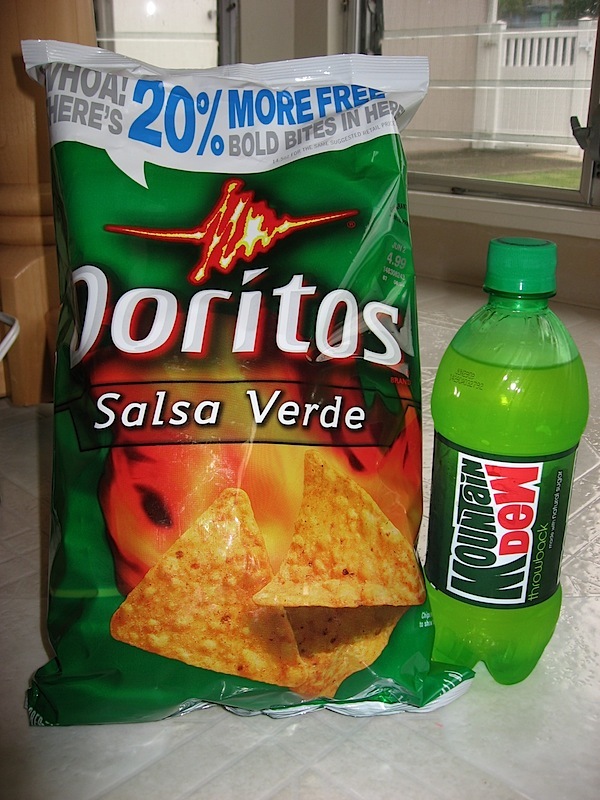 To go with the sweetness of the Mountain Dew, I snacked on salty Doritos Salsa Verde chips. These Doritos have a bite to them, not overly spicy but you do feel a burn after eating a few. The Throwback and Salsa Verde Doritos made a nice green pairing. I think the Pepsi Throwback has a more drastic change in flavor and feel. The Throwback is definitely easier to drink than regular Pepsi. To me, Pepsi feels harsh while swallowing and chugging it would be tough. Not so with Pepsi Throwback. Again smooth and flat like Throwback Dew but not too flat since you’ll definitely burp or fart afterwards. The biggest difference for me was not getting an upset stomach after drinking Pepsi Throwback. Usually, Pepsi turns my stomach a bit, nothing major but still noticeable. Pepsi Throwback didn’t have that affect on me. Could that be due to sweetened with sugar versus HFCS? Pepsi Throwback doesn’t even compare with Pepsi Natural. These are two completely different drinks. The Throwback is Pepsi while the Natural is more like Pepsi-flavored club soda. So is Throwback worth it? I’ll definitely stock up but won’t miss them in the long run.